The rapid infusion of ubiquitous technology has prompted new genres of lexicon to capture the extent of transformation that is reaching into all spheres of human life. Some of these are: Internet of Things (IoT), Augmented Reality (AR), Intelligence Amplification (IA), Artificial Intelligence (AI), etc. All such forms of technological advancement are in various stages of development/adaption/adoption in different fields with AI capturing the limelight supplemented by the strides being made in aligned areas, e.g., Neurorobotics, Computational Neuroscience, Computational Linguistics, Combinational Materials Science, Cybernetics, 3D printing, etc. What kind of changes would be there in the future? Refers to various types of changes, e.g., genetic transmutation, nanotechnology, autonomous transportation, real-time hybrid interactive education, autonomous manufacturing, highly customized services, etc. Why will these changes take place? Refers to the needs that will drive such a change, e.g., cancer cures, extending life spans, human accidents/errors/fatigue/stress reduction, cost optimization, knowledge storage/preservation/consumption, environmental concerns, product robustness/reliability, wow factor, etc. How dominant will these changes be? Refers to the extent of influence exercised by such changes, e.g., will it be exclusive, will it be pervasive, will it last, will it have obsolescence, etc. Who would be the primary driver of such changes? Refers to the influential stakeholders, e.g., top/senior leadership, government regulators, policy makers, global consortiums, industrial alliances, judiciary, public opinion makers, etc. How will these changes look like? Refers to the actual face of changes, e.g., medical nanobots, pilotless commercial planes, cyborg teachers, AI employees, holographic smart-shopping assistants, etc. Refers to an educated determination of the timelines of such changes becoming ingrained in daily life, e.g., next 5 years, within a decade, around 30 years, etc. Where will these changes take place? Refers to the regions/countries/cities/places where such changes will be realized more readily than others, e.g., North America, England, New York, Small Towns, Agricultural Communities, Oceans, Wilderness, etc. 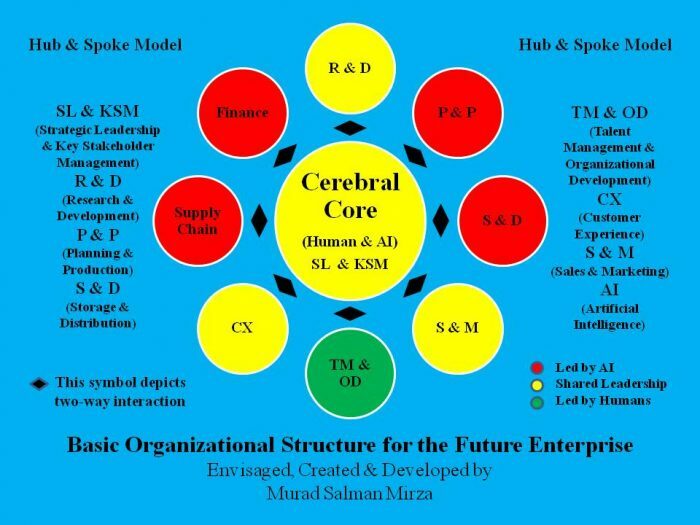 The organizational structure will be no more hierarchical; rather, it would gravitate towards a ‘Hub & Spoke’ model. Most organizations will be global in scope and generally operate with a human workforce of approximately 1000-5000. Such a size will be achieved by the huge induction of AI in different functions and massive layoffs of the human workforce. Consequently, current large multinationals, as a survival tactic, will reduce to such a size and new organizations/startups of the future will eventually reach such a threshold in employees. The new size will evolve into a new type of entity that I am naming as a Medium-To-Large Enterprise (MLE). It will possess the primed agility of a medium enterprise and the matured sophistication of a large enterprise. It will be very highly focused on innovation and supremely technology-driven with AI taking a shared and visible role with its human colleagues/peers. Business processes will be optimized at much higher levels than Six Sigma and practically achieve zero defects. Mergers & Acquisitions will become extinct due to the ubiquities nature of technology/expertise/knowhow. Management Systems will be seen a sacred constitution and will be flexible, but, robust enough to sustain market dynamics. Carefully defined core values will cement the corporate foundations and will be actively practiced by both humans and AI. Formal designations will be minimal and would be largely replaced by strategic and operational roles with clearly defined relevant skill sets. Employees will be tech-savvy and multi-skilled with significant cross-functional exposure. Talent Management will significantly tilt in favor of being a science than an art. Total Rewards package will be highly attractive. Attrition rates will be negligible. There will be high focus on Corporate Social Responsibility (CSR) initiatives and environmental ownership. Big Data use will be prevalent and used extensively in all facets of the organization. HR function will be split into Talent Management (TM) and Organizational Development (OD) with AI having rights as full-time employees through policies/procedures that would cater to their unique requirements. Shared-leadership functions will follow the pattern of the cerebral core by splitting responsibilities according to relevant skill sets. AI-led functions will have an AI as functional head and will be assisted by a team of AI and human members serving in various assigned roles. Humans will only lead the TM & OD function and will be assisted by human and AI team members according to their relevant skill sets. The aforementioned manifestation of the future enterprise has been presented as a thought-provoking reflection of what can be expected to happen in the years ahead. 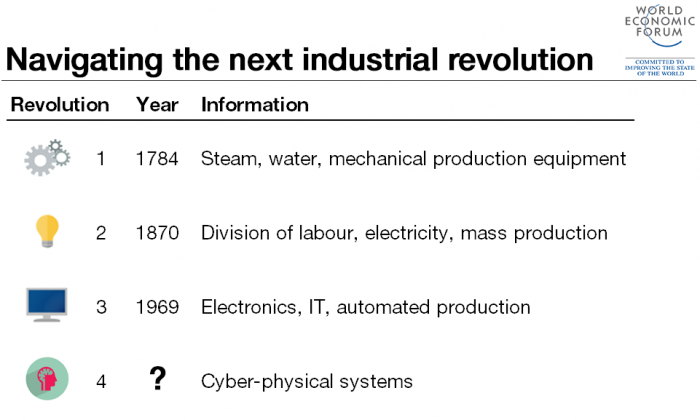 Technology is evolving at a furious pace buoyed by the comforting proclamation of making lives easier, better, longer and richer, however, such exuberant promise has to be realized with the sobering prospective downside of a world that is pervaded with AI, e.g., job losses/mass reskilling/shortened careers/early retirements, safety & security of devastated working neighborhoods, prospects of increased marginalization of less privileged sections of society, rising costs of quality healthcare & fruitful education, unabated birthrates, population underutilization, higher percentage of elderly people requiring proper care, etc.